October 1 was one of those 25-hour days for Phast Phreddie the Boogaloo Omnibus. That morning was the Allentown semi-annual 45s- & 78s-only record show about 80 miles away. That night was WHAM-O WATUSI night. The Phast Man drove a rented car, accompanied by a pair of women record collectors, Yana Lil Jerk and Miss Melissa, who were able to get up and out of New York City by 6:00AM in order to get to Allentown on time for the 8:00 early entry. Suffice it to say records were bought, including a few 78s. Somehow, this seemed to be the fastest Allentown record show ever. As we were in line to drive back through the Holland Tunnel around 6:00PM, Miss Melissa pointed out that we were just there 12 hours ago, but it seemed like just a few minutes. That night, the WHAM-O WATUSI took place at the Bootleg Bar in Bushwick, Brooklyn. Guest DJ was Mister Brandon Peck Pierce, who somehow finds great records to play without traveling tall the way to Allentown! Although Mister Brandon doesn’t seem to have a regular DJ night at the moment, he has excellent records and knows how to spin them. Plus, he is a fantastic illustrator and he made a very groovy, Mad Magazine-themed poster for the night (see below) that inspired The Boog to drag out his “It’s a Gas” record. This particular WHAM turned out to be one of the greatest of all WHAM-dom! 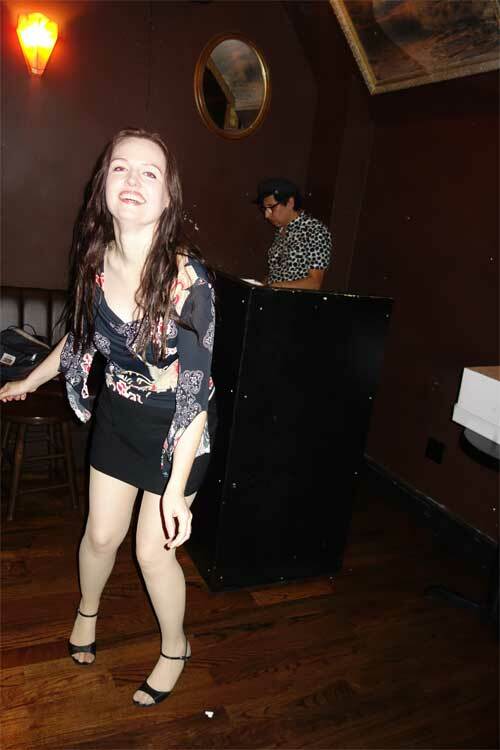 The place was jumping all night, with folks dancing and jumping about, diggin’ the wild sounds being churned out by the two DJs. Miss Nancy “Jeannie” Gardner was on hand to take some photos and hand out crunchy, spicy treats from India.